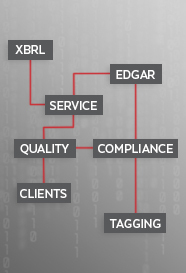 From simple 8-K filings to a complex 10-Ks with XBRL exhibits, you can be confident that your conversion and tagging will be done promptly, accurately, and cost-effectively — every time. Your company’s filings will always be presented to the public in a clean and professional-looking format. We will not outsource any part of the filing process overseas, ever. RDG is a registered Securities and Exchange Commission filing agent and provides expert document conversion and filing services to individuals, publicly traded companies, mutual funds, and other parties required by law to file electronically with the SEC. RDG’s exclusive ThunderDome® Client Portal allows multi-user access to create, manage, edit, and file EDGAR documents. It also includes an intuitive XBRL review tool that is second-to-none. The RDG team consists of EDGAR specialists, CPAs, and Audit Professionals that have more than 20 years’ experience guiding clients smoothly and efficiently through the filing process. Our core competencies are HTML Conversion and XBRL Tagging of documents to be filed with the SEC, and our team was constructed with that in mind. Whether you file 10-Qs and 10-Ks or 20-Fs/40-Fs and 6-Ks, RDG can produce your company’s XBRL filings in guaranteed compliance either the U.S. GAAP Taxonomy or the IFRS Taxonomy. We take pride in the quality of our work, and in our reputation for customer service. Our focus is on all-around excellent service. And with truly flat-rate pricing, we aim to provide our clients both savings and budget-predictability.